I had a strange reaction to this book. I'd heard so much about it, living here in the Czech Republic. 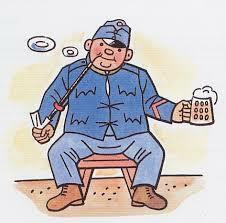 References to and cartoons of the Good Soldier Svejk are everywhere, his character embedded in the collection consciousness. So I finally decided to buy it. I researched the various translations—about which there is much debate—and finally settled on this one. Since I haven't read any other translations, I'm not sure exactly where my critique of the novel and my critique of the translation begins and ends. But here goes. Okay, first of all, I'm not a huge critic of book covers, but...seriously? This is the worst cover ever. Maybe they didn't want to use the classic Lada drawings because they wanted to focus on the grittier, earthier side of the story. Maybe there were copyright issues. But every time I look at this it looks like a nose-less, mouth-less, one-eyed alien with a bow on his head. And everything else about it is equally bad. Sorry. Why not incorporate the guy below? Now for the actual book Some parts are absolutely brilliant. The beginning is darkly humorous. I laughed out loud several times, then felt rather guilty because of the direness of the subject matter.. But the bizarre humor and serious commentary are brilliantly balanced. However, other parts really drag. For example, the chaplain's speeches are way too long without striking much of a funny note with me. The songs are annoying and boring (of course, I pretty much always dislike songs in books). Other parts go on too long. The stories Svejk tells began to feel formulaic—not the stories themselves, which are usually amusing and creative—but the way he comes up with one for every situation and the way he frames them all in the same manner. 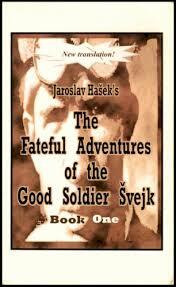 And then there's the vitriolic afterward by Hašek himself, which really put a damper on my enjoyment of the book. I suggest letting the novel stand on its own. Some of the language feels too modern, which has to be the fault of the translation. Or perhaps Hasek was just ahead of his time. Also either the fault of the translator or perhaps the e-book converstion, I did find several typos and errors. One thing I liked about the translation was the footnotes. These included cultural, historical, or linguistic explanations that helped readers understand, but would have felt odd if included right in the text of the novel. I love the commentary on war and patriotism and oppression. There's one scene near the beginning where a bunch of men are in jail for heinous crimes such as saying unflattering things about the Archduke or making jokes about the war. The sixth man, "staying away from the other five, said hat he wanted nothing to do with them, lest he fall under suspicion. He said that he was sitting there merely for the attempted robbery and murder of a farmer…" And here's another pretty powerful line, as the chaplain and Švejk are going out to give a sermon to the troops: "The great slaughter of the World War cold not proceed without a priestly blessing." Also absolutely brilliant: Svejk's character. Is he an idiot? Or a genius? Overall, I enjoyed it, and will probably read the next volume, but I think it's the sort of thing that's best spread out over a little time.